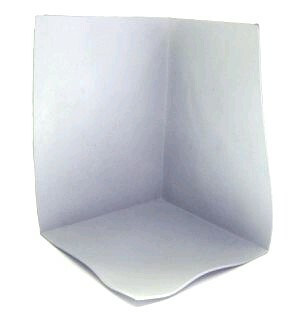 PRODUCT: WHITE Color EPDM Pre-Molded INSIDE Corner Flashing, 6 x 6 x 8 inches high, .060-.075 mil Solid White Virgin EPDM Rubber. Price/Each. DESCRIPTION: Superior mold design eliminates mold protrusions and irregularities of other designs. Also, inside corner is sharper to better fit tight areas. 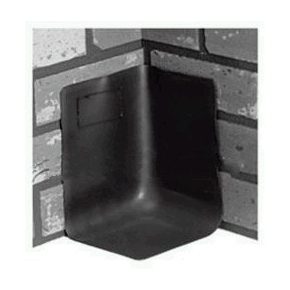 Inside corners provide a leak proof, weather resistant, uniform, permanent corner seal. Pre-molded Corners are 8" high with a 6 x 6" inside flat corner area. They are precision molded with .060 -0.075" thick White EPDM (Ethylene Propylene Diene Monomer). Some grayish discoloration is normal from the molding process. TPO and PVC Curbs, with Eternabond Doublestick adhesive. WHITE EPDM Coverstrip Seam Cover Tape with White Butyl Rubber Peel/Stick Adhesive. LionGUARD Brand, Made in USA. 6 inch wide X 100' Roll. Price/Roll.